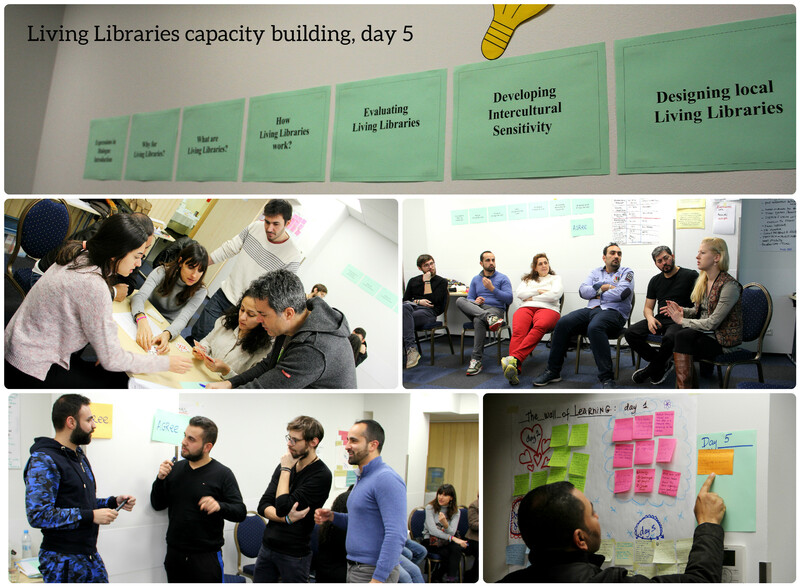 Day 5 at the capacity building Euro-Mediterranean Living Libraries. Here we are, at the day 5! What happens? – Waking up is harder and harder and punctuality gets worse in the people we even didn’t expect… At the same time the number of the sick people reached the maximum. 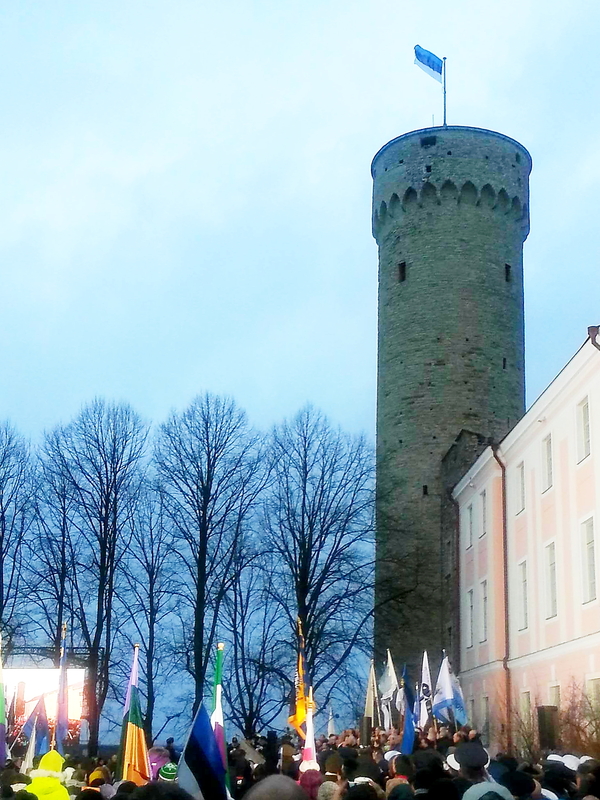 However, the morning for the four member of our team started at 6:30 – this is when those four brave and curious people went to see the raising of the National Estonian Flag with the sun-raise. Usually it happens, but this day it was special, because on the 24th of February Estonians celebrate their National Day – Independence Day, so, there were many important politicians, media and active citizens of all kinds. They returned happy and fresh for breakfast and were exactly at 9 already at the working room (what we cannot say about some other colleagues of ours). Then it came the card exercise, which brought us to important conclusions on many things relevant for interaction between communities, individuals and even states. The emotional reflection and conclusions of this experience was completed with the presentation of the few concepts such as Tolerance of Ambiguity, Acculturation Model and the Model of Intercultural Sensitivity. After lunch we were taking positions and agreeing and disagreeing on very contradictional statements, which in some cases were very polemic and hot (and discussions even continued further on at dinner and other informal moments). It even helped us to get to know each other better and see our deep waters and “icebergs” underneath. 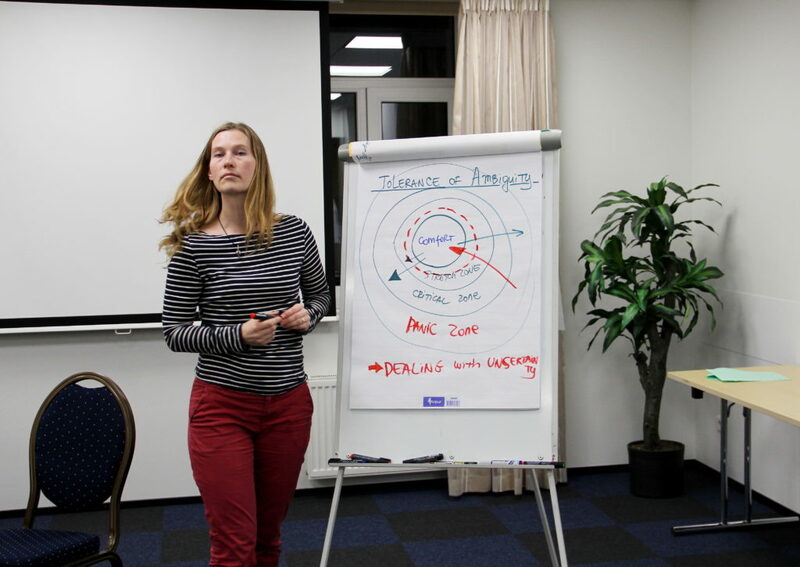 By the last evening session we had a guest visiting us, Mrs. Mari-Liis Mäevere from the Estonian School of Diplomacy, which is the current Head of Estonian Anna Lindh Foundation network. She introduced the participants her Institution, its projects and scope of work. The presentation of the Anna Lindh Foundation raised questions in regards of its mission, structure and funding opportunities. Estonian ALF network is not that large, but has interesting events and is an important partner in mainstreaming Euro-Mediterranean Dialogue in this Nordic country, which does not physically touch the Mediterranean Sea. Some of the organizations represented at the training course are as well members of their National ALF Networks. After dinner we had a space to present OUR organizations, what we did, do would like to do and identified the areas of possible cooperation. I learnt how cultural “rules” are different from place to place. Acceptance of the others the way they are. I got to know more about the other participants’ opinions related to hot topics. Learnt putting ourselves in other people’s shoes (perceptions); empathy. Got to know about the ethno-centrism and ethno-relativism. Acculturation model of John W. Berry was interesting to explore. About the Anna Lindh Foundation aims and objectives. How majorities can impose or absorb minorities. Model how do we tolerate ambiguity: comfort, stretch, critical and panic zones. We played the card game and thanks to the game-exercise we became aware that the majorities try to impose to the minorities and this causes stress to the minority. What we believe is true for us may not be the true for the other person. The point of view of someone else may help us to clarify our own. The debates today were very useful. The game of the inter-cultural casino was interesting. Finding a clear position might be sometimes complex. The difficulty to apply foreign rules to your own social context. The importance to exchange different opinions and points of view in order to have complete vision of reality. Intercultural shock of the Panic Zone. 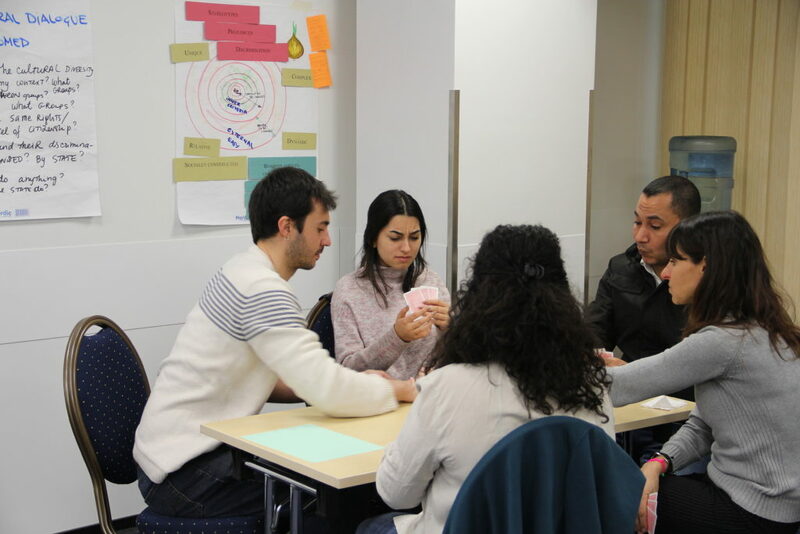 Intercultural casino exercise as a way to reflect upon social processes. Point of view as a decisive factor to judge. The difficulty of intercultural sensitivity. The distortive “glasses” of ethno-centrism.